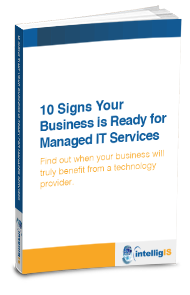 Not sure if Managed IT Services are a fit for your company? Make an informed decision with guidance from technology experts. Technology changes rapidly, making it difficult to invest time, resources and capital to stay abreast of solutions that will help a business run optimally. This is why so many IT departments and businesses are utilizing Managed IT Services to help optimize their technology infrastructure. Dedicating additional energy to grasp the multitude of technology solutions can be daunting – a Managed IT Service plan can help simplify the task. Take the first step to get the information you need – IntelligIS is here to help.